"These are GREAT traps. They absolutley slay the pinfish. No need to cary around one of those huge plastic wire coated beasts. These little suckers do the job, and do it well." "I can attest to the effectiveness of the Catch Live Bait traps. I've tried them and they will catch pinfish when other traps will not. They outcatch the conventional traps probably about 4 to 1. They are amazing!" "I bought two Catch Live Bait traps last year. For the Hargreaves tournament, I put one on one side of the dock, one on the other, wally world in the middle. Each Catch Live Bait trap had 40+ pinfish in them, Wally World had 2. That was in the grass in the sound. I had them in about a 30' span." "I used your pinfish trap for the first time last week, and WOW, did it ever work! I put a Ladyfish cut in half, along with the remains of a cleaned Sea Trout and put it in the water at the end of the dock the afternoon before a fishing trip. The next morning I hauled it up to find it packed with pinfish! The dock master there could not believe his eyes. I am sure the word will get around and I will be asked for your contact info, so get ready for some orders. please advise how I can get your information to my fellow Freedom Boat Club members." "I've been using my Offshore model on a regular basis. And, I'm getting nice numbers within minutes. Unbelievable!" "Got my coastal model in the water today. It was only in about two hours and had already caught about 10 pinfish. These traps are the bomb! Thanks for making a better mousetrap (so to speak)." "All I can say is wow....what a trap. Put the inshore model out near a grass flat last night with a few cut Menhaden and in the morning it was full of perfect sized pin-fish for trout...and just left it near where we were fishing and replenished my bait bucket all day.."
"Bought one of Catch Live Bait traps a couple of months ago (Offshore Model)....Set it out and a Wal Mart trap about 20 yds from each other (same depth)...Wal Mart caught a dozen, Catch Live Bait trap caught almost 4 dozen and is HALF the size of the wally world one.....Just thought I'd throw in some advertisement!!" Each Pinfish Trap is handmade and assembled with very high quality fastening component’s to achieve the highest level of durability and performance. We use specialized tools to insure that the final assembled product meets our expectations for quality, performance and durability. Each Pinfish Trap is personally inspected by the CEO prior to being shipped to any customer. We use industry leading 16 gauge PVC coated galvanized mesh in a 1”x1” mesh size in the construction of our Pinfish Traps. This Marine Trap Mesh is engineered to be corrosion resistant through an exclusive fuse-bonded PVC coating process. This smooth vinyl coating adheres tightly to the galvanized wire so there is no migration of water to the wire and therefore no rusting. This is the best quality and most durable wire mesh we have ever seen. The unique inlet design of our Pinfish Traps is the trademark difference of why everyone will never buy another brand Pinfish Trap after owning one of ours. The unique inlet retains more live bait inside of the trap and does not allow the Live Bait to leave our trap as easy as other trap designs. 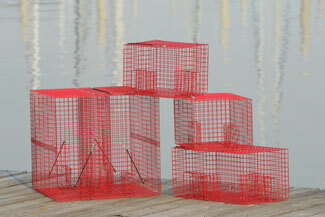 We are able to build a smaller trap in physical size, but one that outperforms all other Pinfish Traps. Ever wonder why your trap had bait in it at one point and when you came back to get it, it was empty? Did some steal your bait? No, the poor design of the Pinfish Trap allowed all the bait to swim out once they were fat and happy from eating everything you put in the trap to attract them. Our Pinfish Traps have been constructed utilizing feedback and design input from generations of fisherman, personal research and development and countless years of field testing. Our Pinfish Traps will outperform competitor’s traps of double the size, period! Bigger is not better……better design is better! New and Improved! We are now using 16ga PVC coated 1"x1" Red mesh for even greater durability and ..
New and Improved! We are now using 16ga PVC coated Red mesh wire for even greater durability..
New and Improved! We are now using 16ga PVC coated Black mesh wire for even greater durability.. This item is for custom orders only. Please email us with a request for a quote with the speci..
You can currently find our products in stores in Florida and Alabama. If you would like to recommend a store, or would like to inquire about displaying our products in your store - please contact us!